Saving and storing your kitchen scraps for composting is one of the most effective ways when it comes to recycling. Composting in the kitchen is very cost-effective, and would only require a supply of your regular organic wastes. Apart from that, kitchen composting can also be used as an alternative to worm composting. There are a variety of options on what kind of bin to use in the kitchen. And compared to a big wooden worm bin that’s typically used in the garden (which typically uses red wiggler worms), you may simply use compost crocks, pails, or buckets as an alternative kitchen compost bin. You may also choose to improvise on your containers by using coffee cans, and/or reused detergent or paint plastic buckets. But if you’d like your bin to aesthetically blend in your cooking area, then you may opt to buy one that is commercially made. If you choose to use a compost crock (usually made out of ceramic or stainless steel), or a compost pail or bucket (usually made out of plastic or steel), then these can definitely help store your organic food wastes on a countertop (where you can easily access it). Using compost crocks for home composting, that are set with charcoal strainers (to help contain the smell of the food wastes) are usually not noticeable, compared to compost buckets that are a little bigger on appearance. This compost bucket also has an odor-filtering system by means of an air-tight lid feature. A worm composting bin can be made easy, as improvising on a few household items for composting purposes can also be done – you can learn more about this from or article: How to Build a Vermicompost Bin. Composting bins in the form of coffee cans, and/or reused detergent or paint plastic buckets can also be used in the kitchen. You may also opt to place these probably near your kitchen door. Anyway, coffee cans with lids are usually used for putting in organic wastes that are usually not many in quantity (especially if you’re not producing much waste in a day). You can easily store this in your kitchen cupboard, or in the refrigerator (refrigerating it can also help control the odor). Reused detergent or paint plastic buckets (should still have lids) on the other hand, can also be used as a container for keeping organic scraps. Before using these, make sure that you’ve already washed off the chemicals inside. These big containers can also be able to store a lot of kitchen wastes for you for many days. But you may have to try putting in some Bokashi compost mix to help contain the odors from your pile. A kitchen eco composter as opposed to a worm bin, can be less tedious to work with. No worms will be involved in the composting process, so there’s less to take care for. Composting in the kitchen is simple and can also provide so many beneficial things. For only $39.95, use the Bamboo Compost Pail for your kitchen composting needs, as it offers dual charcoal filter that helps control the odors from your food scraps. And not only that, it’s also dishwasher friendly, and can be carried comfortably. You can put this on your countertop, as it also blends well in your cooking area. 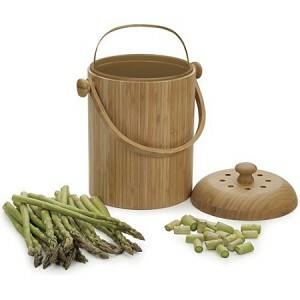 To know more about the product, check the Bamboo Compost Pail here. A compost tumbler is like a barrel that has holes (for ventilation) and a door on it. This is where you place the organic wastes for your worms consumption; and it functions through tumbling and mixing. It is also a tool that has been created to help quickly produce compost (decomposing organic material). For some, the tumbler is kicked around so that the compost and the other contents of it can be mixed altogether. You can also use this as a kitchen compost bin. A compost tumbler may also come in many types, and an example of this would be a tumbleweed composter. Besides that, some tumblers are sold at a high price, so it would also be a good idea if you were to build one yourself. Now, tumblers such as this multi-task, since it does two jobs all at once. It simply does the ‘containing and turning’ all in one container. And one more advantage to using this unit is that it also saves a lot of space when compared to a pile. Although the down side to it is that you might find it a little hard to take out the compost from the tumbler when it’s ready for harvesting. As for making your own, you can simply make an indoor composter by preparing a large plastic trash can (make sure it has a tight lock on its lid) that is about 30-gallons worth; and drilling holes on the lid and base of it. These holes are made to simply allow proper aeration to take place. After this, you can now start putting in your organic wastes and decomposing materials inside the tumbler. These may be in the form of raw vegetable and fruit peels, tea filters, coffee grounds, egg shells, and grass clippings. You may also put-in and mix-in chemical-free paper and/or (pre-soaked) cardboard, dry leaves, and some days old animal manure. Also take note that putting in meat, poultry, fish and dairy products should be ruled out. Don’t use pet manure as well, as these attract unwanted visitors, such as pests. Wastes that are also oily usually takes longer to decompose. Now when it comes to usage, the compost tumbler (you can also choose to use an urban compost tumbler for your composting needs) can start-off as soon as you secure the lock of the container’s lid. You may choose to lay and spin it once; and then bring it up to a stand. You may put in a few more organic materials and then proceed to giving it a spin again (do the same process when needed). The finished compost from this project takes about 10 weeks, until you can harvest it. And when it does reach this timeframe, you may now start taking out the castings from the tumbler, and then filter it into a separate container. You may continue to do the composting process on a regular basis; but you have to make sure that you fill your tumbler with a new batch of organic wastes. The Urban Compost Tumbler is the most efficient and safest composter on the market today. It will only take you weeks to get that quality compost using this composting system. Benefit from its many features as it has a patented central aeration system, kid and pest proof, portable, needs only low maintenance, and more. Purchase the Urban Compost Tumbler with a 60-Day money back guarantee, and a 10-year warranty. Check it out now! To know more about the product, check the Urban Compost Tumbler here. In order to better understand the importance of worm composting as well as the role of composter and compost tumbler, we should first understand how to make one. Compost tumbler is a convenient, easy and fast way to make compost at home just by simply using kitchen scraps and yard wastes and by incorporating worms in the composting process. It can be of great help because it efficiently combines up the content of your pile while evenly distributing its nutrients. Making a compost tumbler can be made in many ways using our ordinary tools at home together with our kitchen scraps or left over. You can build a compost tumbler in any way that you want. You just have to make sure that whatever method is that, it should be dependable. You can also buy earthworms and make use of it so that you’ll be able to know how worm composting can make wonders for your plants. Well to make it more efficient, you should consider red worms or red wriggler worms. Obtain a ridged drainpipe whose division is 10 foot of a 24-inch. Take and cut the pipe into a size that best suits your taste for your tumbler. Just be reminded however that when doing this, you should be sure that you can manage the tumbler size safely. At the end of the tube or pipe, if there is available plywood, all you need to do is just cut it. For it to be more durable you may want to alter it with a specialized kind of wood or you may simply use cedar plywood or a plexi-glass. 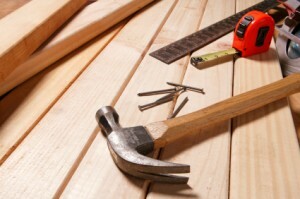 Use a bungee cord to fasten the wood and also, use bolts of quarter-inch. Drill or bore holes to ensure proper ventilation for your compost. Cordless can also be used and this is in fact considered as one of the easiest ways. After that, presto! You are done and you already have a homemade compost tumbler! By following these instructions, you will be able to build a compost pile in just an hour. After seeing the advantages of the project, rest assured that you will be able to improve your investment as well as the quality of soil that you are using. With all of these, why don’t you just make use of its advantages and be part of the growing population of the compost tumbler users now? You will not just be an environment lover; you will also become a worm composting advocate! Can’t find time to make your own composter? GardenWorms.com recommends the Tumble Weed Composter. 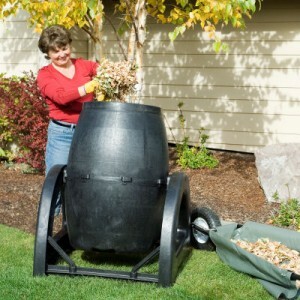 This easy to use compost tumbler provides functionality and durability for your composting needs for only $179.00. Read more about the Tumble Weed Composter here.